Most of the Senior citizens in India who do not like the volatility that comes with Equities / mutual funds prefer to save and invest in Fixed Deposits, Recurring Deposits and Small Saving Schemes. The main reasons for saving in these financial products are – low risk, guaranteed returns and fixed income. Is interest income earned on FDs, RDs or Savings account taxable? – Yes, it is a taxable income. However, a deduction of up to Rs 10,000 is allowed under section 80TTA to an assessee in respect of interest income from savings account. 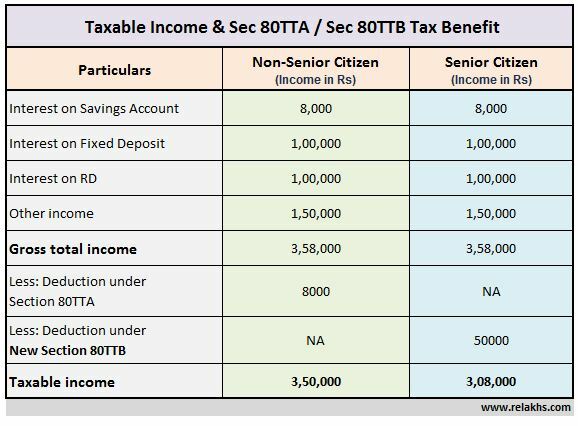 The Budget 2018-19 has proposed to insert a new section 80 TTB so as to allow a tax deduction of up to Rs 50,000 in respect of interest income from deposits held by senior citizens. This amendment is effective from Financial Year 2018-19 / Assessment Year 2019-20. Non-Senior Citizens can claim a tax deduction on savings accounts interest income of up to Rs 10,000 u/s 80TTA. Senior citizens can either claim Rs 10,000 u/s 80TTA (or) tax exemption of up to Rs 50,000 u/s 80TTB. The scope of 80TTA is limited to ‘interest income’ on Savings Account only. 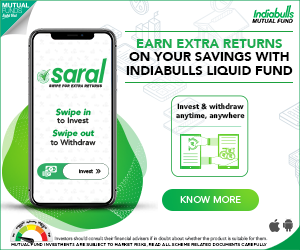 Section 80TTB is applicable on interest income earned on Savings accounts deposits, Fixed Deposits & Recurring Deposits held with Banks, Post offices and Co-operative Banks. Is interest income earned on Small savings schemes like Senior Citizens Savings Schemes deposits tax exempted up to Rs 50,000? – As of now, there is no clarity on this. But, I believe that interest income earned on deposits linked to Post office savings account can also be tax exempted up to Rs 50,000 u/s 80TTB. However, section 80TTB is not be applicable for pension schemes like Pradhan Mantri Vaya Vandana Yojana (PMVVY). In the Union Budget 2018-19, the Finance Minister has also proposed to provide Rs 40000 Standard Deduction from salary income to all employees & pensioners. Overall, the Budget 2018-19 might have disappointed many but senior citizens have some good reasons to cheer! Is Section 80TTB applicable if a senior citizen earns interest on fixed deposits with Bajaj finance or similar finance organizations ?? Or is it explicitly applicable for interest earned from Post offices and banks only ? Also, in case of cumulative deposit for 36 months (No monthly payout), when would it be taxed ? on accrual every year or after maturity ? I believe that Sec 80TTB is not applicable for Company FDs. 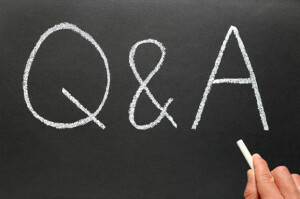 is the tax exemption of Rs. 50000/- under 80 TTB is irrespective of whether the SCSS is with notified banks and post office or post office only. There is no clarity that the interest earned on Senior Citizens Savings Scheme (SCSS) is eligible for relief or not U/S 80TTB. Not very sure about this…. Could you kindly list out the (7) Annuity options here?? Also, kindly go through this article @ Lump sum Investment options for Retirees/Senior Citizens | Where to invest my Retiral benefits to get Regular Income? Will you p[lease clarify what is other income as shown in the last table ? Dear Prabal ..It can be any taxable income. For example : Annuity income. Dear Ashok ..Yeah, its a typo error, corrected the mistake now. Thank you for pointing out this mistake.